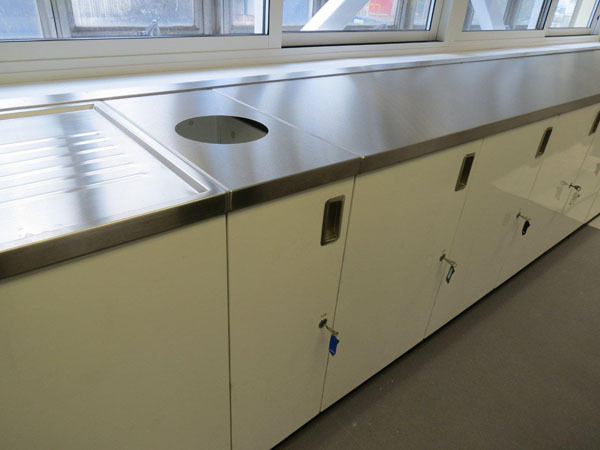 Apex kitchen units are a high quality alternative choice from either wooden style units designed for domestic use, or the hugely expensive stainless steel units used in commercial hotels and restaurants. Our units are available in a wide range of colours with a choice of high gloss, satin or matt finishes to complement any existing decorative system. These quality units will enhance the appearance of your room, avoiding the harsh industrial look of stainless steel kitchens. 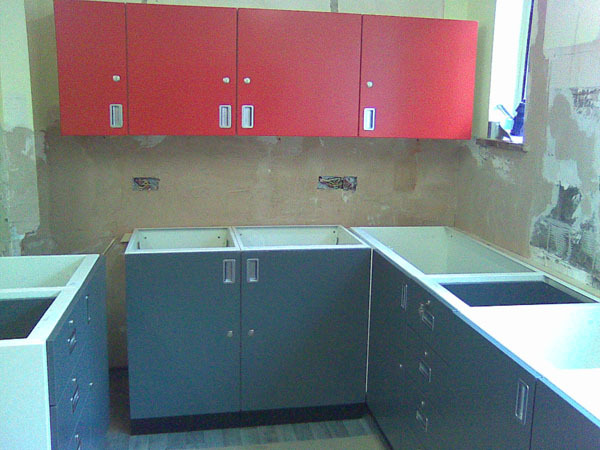 To customise your kitchen, we can finish your wall units in a different colour from the base units. 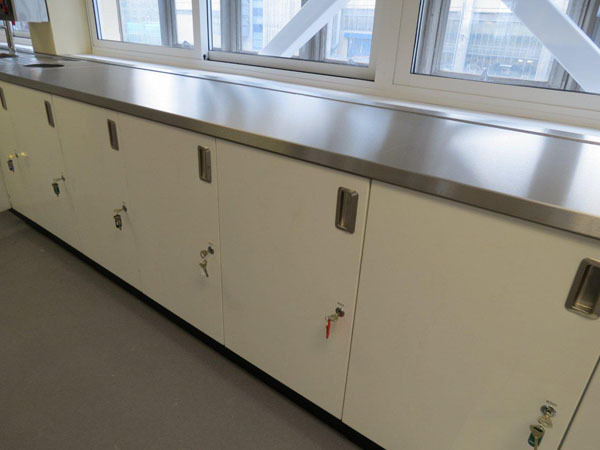 Apex Armour Kitchens are suitable for any installation, but especially those in heavy or constant use, and which require a highly durable and robust installation. This makes them particularly suitable for use in children’s homes, care homes, residential centres, secure units, hospitals and offices. Additionally, they do not harbour insects and are resistant to vermin attacks. 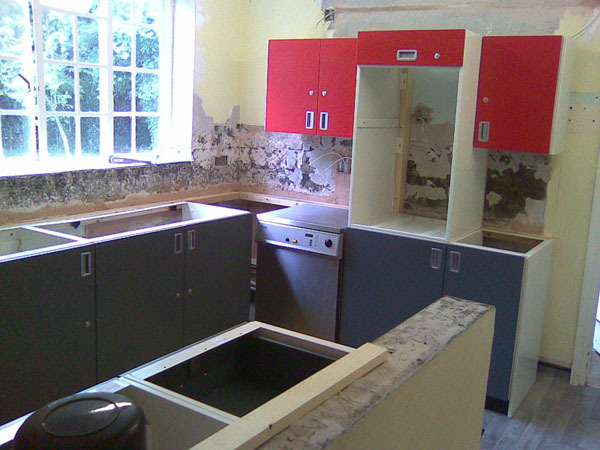 Because Armour Kitchens do not contain woodchip, they are ideal for use in properties or buildings at risk of flooding. 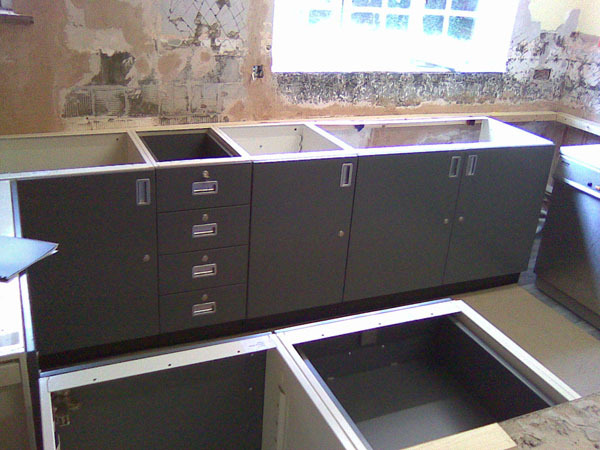 Where conventional kitchen units would need to be replaced, our steel units will not be damaged by flood water. Armour Kitchens from Apex – the sensible choice! 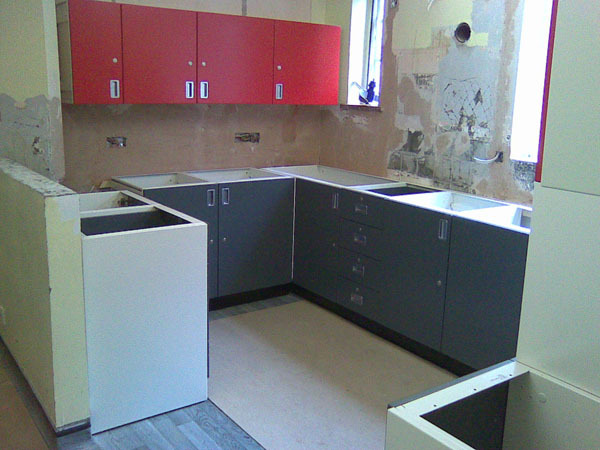 Our kitchen units are of extremely robust steel construction and come in a huge array of contemporary colour finishes. 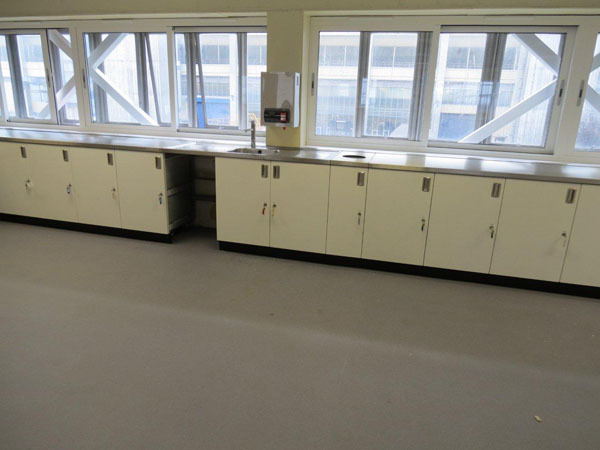 Bespoke units can be manufactured to fit any space. These units are designed for heavy use in challenging environments but can actually look stunning in any situation. They are ideal for use in public service buildings, university halls, schools, hospitals, care homes and are even suitable for high-end residential installations. All Armour Kitchen units are fabricated from1.2mm and 1.5mm steel sheet and are a fully welded construction, making them very robust and durable. They are not riveted or crimped. This ensures that they are extremely sturdy and can withstand the rigours of daily use in a tough environment. All hinges, handles and any fittings are screwed into threaded inserts, not simply fixed using self-tapping screws which can work loose over time. All drawer runners are heavy duty ball bearing slides giving very high drawer loading capacity. Doors and drawers are available with soft close options. All units are designed to screw together making the whole installation extremely rigid. All units are pre-treated against corrosion and polyester powder coated meaning that your kitchen will retain it's quality appearance for many years. Each unit can be left or right handed opening. We offer a variety of handle options from recessed for safety, to surface mounted decorative models. 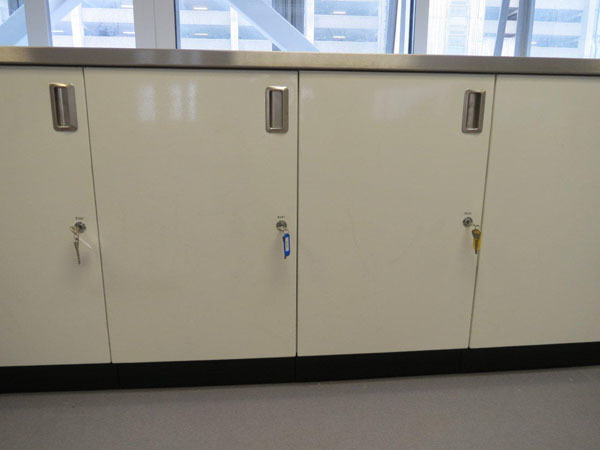 Units can be manufactured with locks on the doors and drawers if required. Shelving is easily adjustable. Click here to view the brochure with more unit and colour information. Please discuss any security concerns you may have with us and we can give you the best advice on the most suitable options. 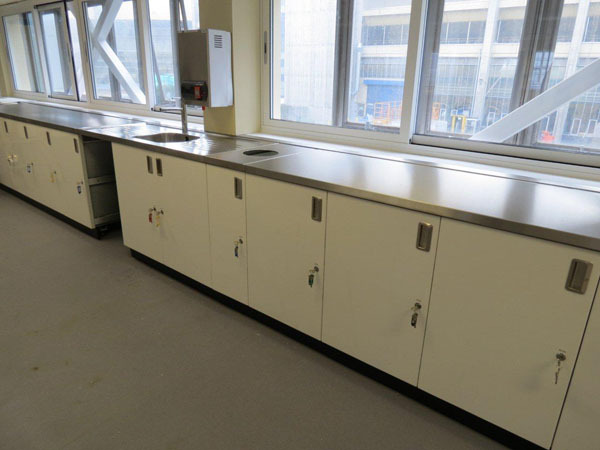 Apex Armour Kitchen units include many innovative features so kitchen installation can be completed in far less time than with standard kitchen units, offering considerable savings in labour costs. We also have a team of experienced kitchen fitters who can install your kitchen units and worktops anywhere on the UK mainland.